When we get defensive, we make it that much harder for our conversational counterparts to hear what we’re saying. We also make it harder to really listen to what *they* have to say. Soon, we’re shadow-boxing, defending ourselves against attacks that aren’t real, and wasting energy — and relationship capital — on damage control instead of solving the problem at hand. If you get hooked into defensiveness — and most of us do — you probably already know it. It’s likely come up in conversations with your boss or your spouse. And when it did, you probably got defensive about being defensive. After all, it felt like you were being attacked! What else were you supposed to do? Strike 1 – Think of the first thing you want to say or do and don’t do that. Instead, take a deep breath. That is because the first thing you want to do is defend yourself against what you perceive as an attack, slight, or offense. Strike 2 – Think of the second thing you want to say or do and don’t do that, either. Take a second breath. That is because the second thing you want to do after being attacked is to retaliate. That is only going to escalate matters. Strike 3 – Think of the third thing you want to say or do and then do that. That is because once you get past defending yourself and retaliating, you have a better chance of seeking a solution. 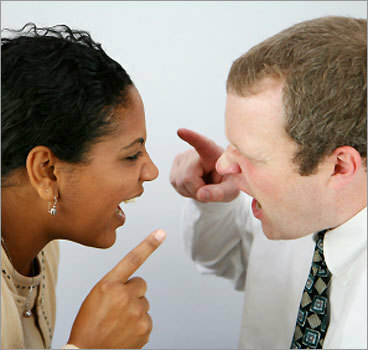 The main reason to stop getting defensive is that it usually triggers the same response in the other person. If instead you look for ways to be more solution-oriented, you will soon find yourself on your way to more cooperation and collaboration. If you’re struggling with what that non-defensive, non-retaliatory, solution-oriented statement might be, focus on being a “plusser.” A plusser is someone who listens to what the other person says and then builds on it. But what if the person is genuinely unfairly attacking you? What if they’ve said something you really believe is untrue — you can’t say “yes and,” or “say more about ____” in that case, can you? In that case, you might try a “controlled confrontation.” You do this by pausing after they speak for a full count of three in your head. This will both take the conversation away from escalating and may cause the other person to become nervous. If they do, that will work in your favor. When you don’t take the bait, they are in unfamiliar territory and this can have a slightly disarming effect. By being unflappable and standing up for the principles of fairness, and reason, and mutual best interest, you will be better able to stand up for what’s right — and stand up to them in a way that is neither defensive or provoking.